After two successful public test events the new Wembley has been granted its test certificate by Brent Council and the FA has wasted no time in announcing the stadium as the venue for May 19th's FA Cup Final which could yet feature the dream final of Chelsea v Watford, though it might just as well see Blackburn facing Manchester United. The FA also confirmed that the players of Stevenage Borough and Kidderminster Harriers (FA Trophy final, May 12th) will get the chance to test out the 107 steps to the royal box before their Premiership counterparts as will their colleagues from some combination of Curzon Ashton or Truro City and AFC Totton or Billingham Synthonia (FA Vase final, May 13th). Outside the ground we asked a steward if he could take a photo of us with my mate’s camera. He refused and said that company policy stopped him from taking the photo in case the camera got broken and steward and company were sued by us. So we used common sense and grabbed a random bloke to take the snap. [A member of staff] passing by, pointed at my camera and told me they were not permitted. Bags were turned inside out, screw tops were removed from drinks bottles, and the guy in front of me had to throw his can of deodourant into the bin (which he was most upset about). 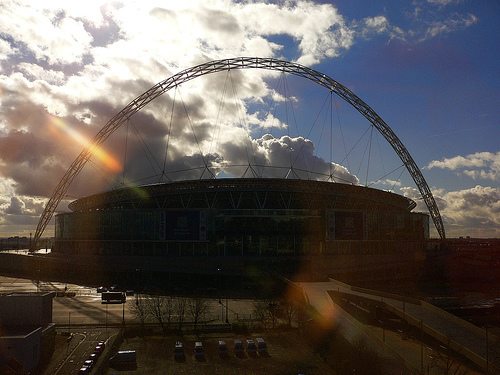 Stunning photo of the new home of football via Pixelthing's Flickr stream. It was busy at the station, but appeared to be coping with its first real test since the old Wembley hosted its last game six years ago... Even the journey back to the tube station- criticised in the past - was again well marshalled by police. Letting a certain amount of people into the station at any one time stopped the inevitable manic rush for the tubes. DF and I comfortably got a seat on a Jubilee Line train around 20 minutes after leaving the stadium - not bad. It didn't look to me like any work had been done at the station [Wembley Park] itself in order to deal with the increased number of fans... we left 10 minutes before the end... When I got to the top of the stairs at the tube station and looked back along Wembley Way all I could see were fans with at least an hour's wait to get on a train. When you get to the top of the station steps and see the arch for the first time you can't help but feel just a little bit awestruck. The famous walkway was full of people looking in awe and taking snapshots as they walked, so many infact that the police had to tell people to keep walking to get everyone moving towards the entrances. The huge arch is not that special in daylight as it is just a load of white tubular steel but at night it looks fantastic all lit up as we saw from our hotel window on Friday night. Up close it's terribly sleek and modern, in signature Foster style. Seemingly hundreds of acres of concrete walkways, gangways, elegantly curved glass walls, polished steel shutters, escalators and handrails. With its dark marble tiled floors, sober colour palette of greys, whites and black (the idea being that the supporters add all the colour and life), it reminded me of nothing more than a swanky business class lounge in some fancy new airport. Ever-so-slightly corporate, cold and charmless. Apparently Wembley Stadium has more ladies toilets for its capacity than any other venue in the UK. There were still queues at half time but at the end of the match they had held up well due to the constant attendance of the housekeeping staff. It's not the same as watching Charlton.